It is one of the reliable and best hand saw for cutting wood in various shapes in carpentry and woodwork. These are basically made up of a thick steel blade having sharp peaks (tooth) tilted in one direction at one end and smooth and bit thick to its opposite end, fitted in a handle. 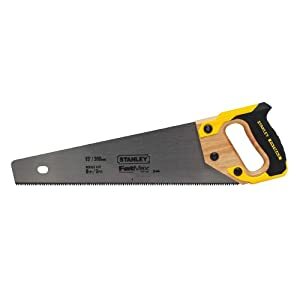 Stanley 20-045 Fat Max Cross Cut Hand Saw is an excellent tool available at reasonable prices. It is capable enough to cut every type of wood in different shapes but it is mainly used for cutting the wood at straight with minimum binding. In carpentry work, this type of handsaw is very comfortable as it can cut the wood faster than other straight hand saws. The tooth in the blades of these hand saws are more durable and cuts the wood more than five times before blunting when compared to other handsaws. Especially this handsaw is best at cutting rapid hardwood cuts and is also very sharp to cut two to three inches thick branches of a tree. This type of handsaw is very comfortable to hold even while working on the hardwood as its thick handle consists of a grip of rubber that avoids slipping during its use. The reverse side of the blade of Stanley 20-045 Fat Max Cross Cut Hand Saw can also be used marking angles of 45 to 90 degrees for quick measuring. These handsaws do not provide lifetime warranty in terms of their high quality and durability. Though it the best hand saw for cutting work it is not capable enough to cut firewood and very thick logs and it requires resharpening when used continuously. A great Neck Hand saw is also one of the best hand saw to cut trees made in the USA. It is made up of a 26 inches steel blade which is of high carbon and has teeth that are at 10 TPI. In these kinds of hand saws, the cutting edge is directed in an alternating way and each tooth acts as the edge of the knife. Some special teeth are also added to its design whose purpose is to clean the cuts removals while cutting the wood. They are quite similar to ribbed saws and can be used for cutting even rough and forceful cuts along with fine cuts. It can smoothly cut all types of wood such as hardwood or softwood as desired by the carpenter. Great Neck Hand saw has the accurate set of more sharpened flexible teeth to provide the control on cutting all cross cuts. This hand saw for cutting wood is very comfortable to hold in its indoor and outdoor uses and provides a lifetime warranty. It is an ideal tool for all types of trimming and cutting indoor and outdoor woods. 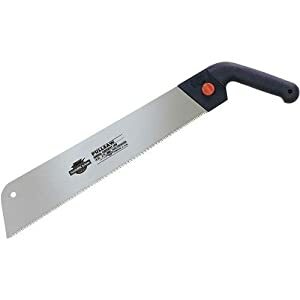 Shark Corp 10-2312 12-Inch Carpentry Saw is also one of the best hand saw to cut trees and the tree roots can also be trimmed. It can also be used for working on laminated hardwoods or figuring out plastic pipes. It is usually of 12 inches having a strong blade of stainless steel with 14 TPI that means it may cut all types of wood quite faster and smoothly. For baseboard molding and trimming it also consist of a natural bend. Its handle is basically made of plastic and is gripped for relaxed working during hot summer days to avoid disturbance due to sweat. 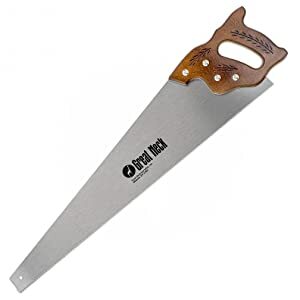 The blades of this kind of hand saw are replaceable also when they become dull, but it lasts for years if the one keeps it sharpened at regular intervals of using it. It offers a warranty for one year. However, these hand saws are not ideal for cutting very hard wood as it results in a slow cutting process. These hand saws are basically designed to cut on the pull stroke action having the rust-resistant blade. Usually, these handsaws are used for giving finishing touch and for fine trimming in carpentry projects. Its, thin blades provide accurate and quick cuts. These handsaws are of excellent quality and are more durable than other hand saws for cutting wood. 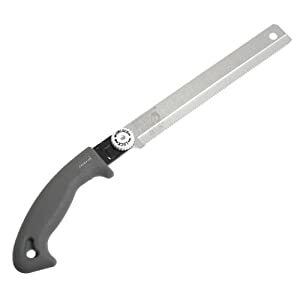 Vaughan BS240P Pull Stroke Rip Handsaw consists of a thin blade i.e. of 0.022 inches and is for more fine woodworks. It has 17 TPI and hence only clean straight cuts are allowed through this hand saw. These hand saws have good flexibility and are available at affordable prices. It has few safety elements such as a locking blade, a blade guard for the hand saw’s teeth protection and a gripped plastic handle. Its blade is removable also and hence can be stored in the toolbox easily as desired by the user. These hand saws are ideal for the carpentry projects that required medium or small woodworking. These Universal hand saws are known for its super fast cutting that allows all types of cutting in carpentry work. The blades of this cutting tool can be used at hard ends. These Irwin Universal Hand Saws reflect a design of high quality that is very easy to use. It is of 15 inches and consists of extra sharpened teeth of the triple surface that can cut the wood faster to three times than other hand saws. The tooth grinds in this type of hand saws are designed in the way that it removes the material rapidly and provides accurate and clear cuts in the wood cutting process. Its thick blade helps in fast, clear and controlled cutting in woodworking. These hand saws are ideal for both the professionals and the home use for wood cutting. It can perform all kinds of cutting tasks i.e. from aggressive cuts to fine smooth cuts that require more control, its patented yellow and blue handle eliminates barriers and allows complete stroke actions. They are very much comfortable for holding and hence diminish the fatigue in hands. These hand saws provide the lifetime guarantee. 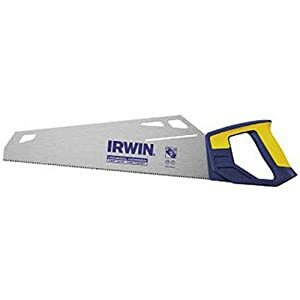 Irwin hand saws are available with reasonable price to begin and therefore one doesn’t need to worry about getting this saw in the dirt or hard cuts. These handsaws are good enough for every task but they cannot be resharpened when required and also is unable to provide long cuts on hardwoods. Crown Hand Saws are the combination of both new and old techniques of making hand saws and thus manufactured as a high-quality cutting tool. It can be used for small repairs, joint work, tabletop work and also for the trimming the flat surfaces. The blades of the crown hand saws are 17 TPI that provides clean precise cuts. 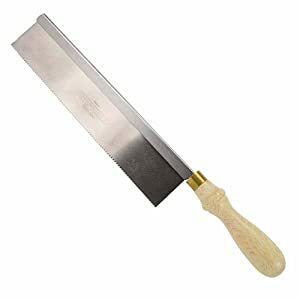 It is, one and a half inch blade is of hard steel along with the brass support that provides it more strength for cutting every type of wood whether it is hard or soft wood. It also provides resistance to wear, corrosion, or tear and hence provides the results of high quality. They have rigid back and are usually used in detailing work such as making picture frames, cabinets, showcase frames, and other small indoor wooden work. These cutting tools deliver excellent performance and are very comfortable to handle while woodworking. They provide very clear and accurate cuts in carpentry projects. Crown Hand Saws needs resharpening after multiple uses. 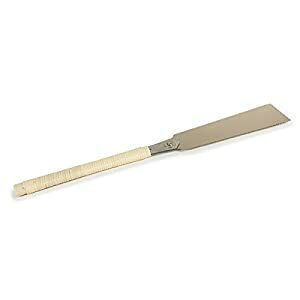 Ribbed and Back Hand Saw: It is one of the common and best hand saw to cut wood. The ribbed hand saws have large teeth that are leaned forward and slightly tilted towards the left or right side of the blade. They work on the push stroke action while cutting the wood. They are basically used for cutting the large wooden boards or planks as the ribbed saws provide control to the carpenter. Back Hand Saws are short saws having a wooden top edge as support to handle. It has sharp teeth on both sides of the blade and due to its lightweight, it is easy to use by the carpenter as it requires a mild pressure on its blades that allows precise cuts in woodworking. Its blades can be resharpened and can also be replaced with the new blades. Carpenter Saw: These are also one of the wood cutting hand saw which is used by the carpenter mostly. These kinds of hand saws have and large shape handle in which the long strip of the blade is attached. These are the most common hand saws but cannot be termed as the best saw for the carpentry project. Due to the large size of carpentry hand saws, it is quite difficult to use it by the beginners in carpentry. These handsaws have wide kerfs and its blades are replaceable but the replaceable blades are harder to find in the market. These hand saws are available in both crosscut and ripped style. Though as mentioned above crosscut hand saws are more popular than others due to its versatility. However, the rip by the crosscut hand saw may take a little more time and leaves many uneven cuts when moved through the wooden board. When the crosscut saws are used they shall be held at 45 degrees or 60 degrees when the rip saws are used. Coping Hand Saw: Coping saws are used for cutting the fine edges in woodworking. As indicated by the name it is basically for shaping the fine edges in the carpentry work to match the molding profile. Coping hand saws cannot be used for cutting the wood at the straight line but they are very good to use while giving the difficult curves to the furniture. The blades of coping hand saws generally cut on push and pull action strokes but usually, it breaks down when used on pull action stroke.